This, or something like it, will be the front cover. 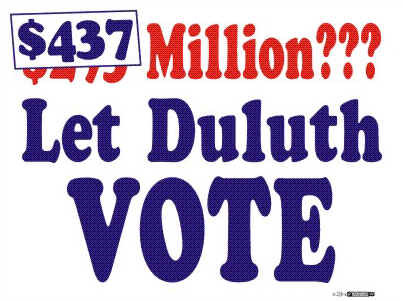 Former Duluth School Board member, Columnist, blogger and web page author and spokesman for Let Duluth Vote. This investment opportunity will only be open for one week and will be closed as of Monday June 29th, 2009 , or once $100,000 has been raised, whichever is sooner. This will be a short term investment and all profits from the book sales will be distributed no later than Dec. 31st, 2009 . This email written by Harry Welty on June 22, 2009 and sent out to 200 angry Duluth Taxpayer’s explains the investment opportunity. I got a fearful email this morning worrying that my book idea would cause me to stop raising money when we really need the money. WRONG WRONG WRONG…….It is how we will raise money: Read my reply now because we can’t afford any confusion about how I propose to raise money. While you’re reading you may even discover how to make a little profit on the bond. I don’t and won’t have time to write any darned book until we’ve raised our $100,000. If we don’t raise it I’ll still write it but we won’t have our bond and at the moment that’s the only thing that counts. Because I’ve analyzed the economics of this I know we can “sell” a minimum of $75,000 to $80,000 dollars worth of books by October. I need people to understand I intend to apply that money to cover the costs of potential losses should we lose the court case and forfeit the bond. THAT WOULD MAKE CONTRIBUTING TO THE BOND A LOW RISK DONATION with the possibility of also winning the court case and getting all the bond money back. 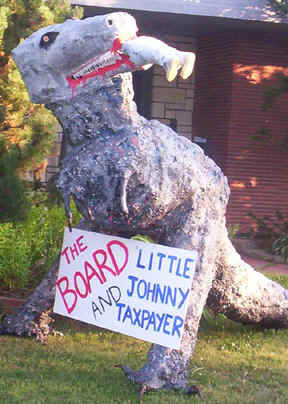 If that were to happen donors would get their $100,000 bond back AND share in any profits generated by the book’s sale. Printing a 200-page book would cost about $1.50 a book. Mailing it would cost about $1.50. If we sold them for $20 that would give us a $17 profit per book. So who are our potential book customers and book investors? There are over one hundred Ordean homeowners who will lose several percentage points on their home valuations if Dr. Dixon builds Ordean High. There are at least 500 major licensed landlords paying through their noses on Red Plan taxes which are set to increase. The list is being sent to me. 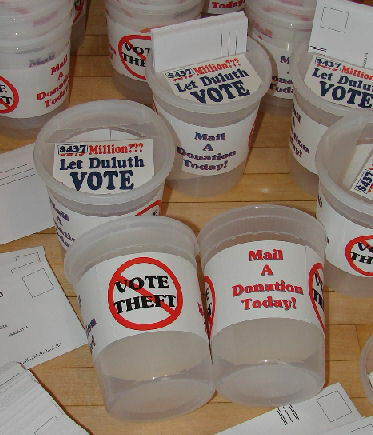 Let Duluth Vote has received donations from over 1500 separate households. There are 85,000 taxpayers who could see a 30% to 50% reduction in their school taxes if a reasonable alternative to the Red Plan is substituted by the new school board elected this fall. Four seats out of seven are up for a vote. That’s a majority. Does anyone think a pro-Red Plan candidate stands a chance of winning? I don’t. There are thousands of Duluth Central Alumni. There are probably tens of thousands of people who are mad at JCI . There are millions of people who love underdogs. We don’t need any of these people to buy my darned book by June 30 but we do need $100,000 for a bond. I’m prepared to put $5,000 toward the bond on the expectation that once the sales come in I will be reimbursed. 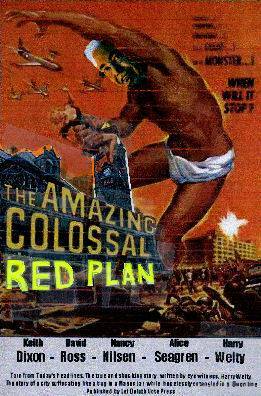 In fact, the only way I can hope to recover the $12,000 I’ve spent fighting the Red Plan so far is to make sure we sell $150,000 worth of books by October. I’m looking at this like both a conservative and an entrepreneur. Being a conservative I’m operating on the expectation that we will lose the case and forfeit the bond. But as an entrepreneur I know that IF WE SELL ENOUGH BOOKS AT $17.00 PER BOOK NO ONE WHO CONTRIBUTED TO OUR BOND NEEDS LOSE ANY OF THEIR DONATION !!!!!!!!!!!!!!!!! This is MUCH more than people taking a risk on winning a law suit and praying to recover some or all of their money. This is an investment opportunity! I want anyone kicking in anything over $1,000 to be paid off first FOR THE AMOUNT OVER $1,000 THEY DONATED/INVESTED. After we’ve paid off the investment portion I want every donor paid off. If we sell/raise more than $100,000 I’m prepared to share the additional proceeds with anyone shrewd enough to have invested in this project. Think of AMWAY. Think of all the sales people we would have. First and foremost everyone who stood to lose their bond money would have a big incentive to spread the word and sell this book. AND YOU CAN BET THAT MEANS ME. I don’t want to lose another cent let alone $5,000! You and I know in our hearts that 2/3rds of Duluth hates the way the Red Plan was forced down our throats. That doesn’t mean that we can sell a $20 book to 30,000 households. Well then, how many books could we sell in Duluth alone? I’ll bet we could sell 3,000 easy. After two years of “advertising” this book (fighting the Red Plan) these books would be scarfed up by people like seagulls attacking French fries. At a profit of $17.00 per book we’d have to sell 5,833 of them to raise $100,000. We don’t even have to spend anything on printing until we know how many books to order. We will wait for presales to tell us how many to print. We got another $1,000 check Saturday from someone who had no guarantee of getting it back before this method of fund raising occurred to me. That’s four $1,000 checks. Two more are pledged. I’m prepared to put $5,000 in this investment myself. If I can find enough people like me who can see a good business opportunity we can use their money to leverage additional contributions. We could announce tomorrow, Tuesday, that we have a matching fund of $50,000 and are looking for other contributors ASAP to raise the bond. Until we raise our $100,000 we can keep letting “investors” in. Every $10,000 worth of books we sell in the next two months will take 10% off the potential loss to Bond donors. If we make $100,000 in book sales every donor to the bond will have to declare them as earnings on their 2009 taxes. I’m not panicked by any means. As Ambrose Bierce once said: “When a man knows he is to be hanged, it concentrates his mind wonderfully.” I’m concentrating really hard right now. If we get a $100,000 bond and a temporary injunction Ordean will remain a middle school and Central will remain a high school. I thought Judge Hylden would bump the bond up to a million dollars last week. He didn’t. I take that to mean he’s watching to see what we do because he could have put us out of our misery last week. If we fail to raise $100,000 he won’t have to accept any of the blame. But the longer he waits while we’re ripping our hearts out raising the bond the harder it will be for him to justify putting us through all this hell. If there aren’t a dozen “venture capitalists” out there Duluth will never have a future. We just have to find them to save our schools from a deranged School Board. To invest simply print out this pledge, fill it out and write "investment" at the top include your check and mail it to the listed address.